Tis the season for holiday parties! Whether you’re attending or hosting, there is usually some stress for everyone involved. Avoid the anxiety this year by hosting your holiday party at Painting with a Twist. People have so much going on in their life this time of year, it’s hard to keep up with a to-do list for the holiday season. Paint and sip parties are a blast for 3 obvious reasons: A little bit of art, a little bit of wine, and a whole lot of fun!® Today, we’re going to break down four other reasons why holiday parties with a twist are the best. Julia Child hit the nail on the head when she said, “A party without a cake is just a meeting.” Don’t stop at cake! We invite you to bring an array of treats when you host a party at Painting with a Twist. You can ask your party guests to bring a potluck dish or plan to have the entire event catered with your favorite snacks. Throughout your holiday party, you’ll have to take a few breaks and step away from your painting so that the paint can dry. This is a great time to fill a plate with delicious treats or refill your glass. It’s also a great time to play some hilarious and fun games with your instructor! We pride ourselves on putting the “art” in “pARTy” so get ready to let loose. Our instructors have plenty of fun and games up their sleeves for you to play: anything from karaoke to dance contests to a wine cork version of hot potato. The prizes are pretty great, too- winners leave with a variety of PWAT swag and maybe even an extra painting chosen from the prize painting wall. Ready, set, mustache contest! 3. Everyone leaves with a painting and a memory. This is the best reason of all – everyone unleashes their creative side, tries something new as a group, and leaves with a piece of artwork to call their own. A holiday party doubles as a tremendous bonding experience whether your guests are your friends, family, or co-workers. You’ll never forget the sensation of accomplishment and camaraderie… AND you’ll have a beautiful, new piece of artwork to hang on your walls. 4. Leave the mess to us! Let’s face it – party cleanup can be a major hassle. So we’re here to take care of that for you! Once your holiday party has wrapped up, you’ll get to return home to a sparkling clean abode. Now that’s a Christmas miracle. 5. We do parties 7 days a week. You set the time, you pick the painting, we do the rest! 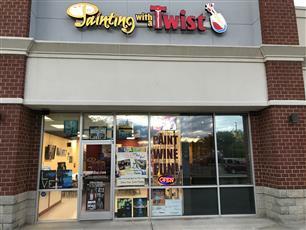 5-Star Paint and Sip in Lake Norman! I had been wanting to try this for a while and I was thrilled to experience it. We had a great time. A little wine, some laughs and games....who could have a better time? It was just great to be a part of something like this. The ho hum of everyday life got you down? Go to Painting With A Twist, it is a great distraction! !